Merging into fast-flowing traffic on a motorway is something a huge number of people seem to have great difficulty with. They try to merge at 60kph when the traffic is doing 100kph, holding people up and causing a danger. When the ramps are constructed, road engineers try to make them as easy as possible to safely merge so that traffic congestion is reduced, and dangerous situations don’t eventuate. This includes the design of the road itself but also the choice of guardrail and vegetation. What is the merging speed? Some ramps only require vehicles to get to 80kph whereas others require vehicles to get to 100kph. Getting vehicles to the right speed reduces traffic congestion as it means that vehicles already on the motorway don’t have to brake to accommodate merging drivers, an action that can cause phantom traffic jams and jamitons. This influences the length and gradient (slope) of the on-ramp. If the gradient is around 6% downhill (i.e. a 6m drop for every 100m in horizontally) then it can take half as long to get up to 100kph as a flat road. Conversely, if it’s 6% uphill, then it can take twice as long. To some degree this is mitigated by road users: they choose to use more power to still get up-to-speed in time and adjust their acceleration based on their perceptions of the distance they have to match their speed. 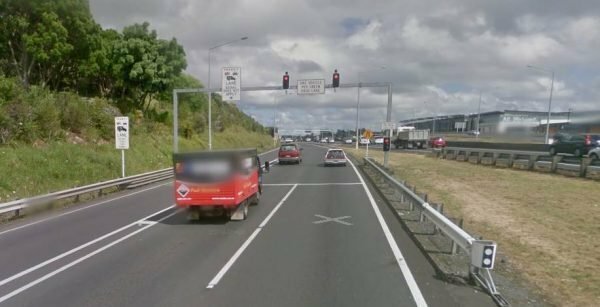 How visible is the motorway from the on-ramp? This takes into account whether vehicles entering the motorway can easily see vehicles already on the motorway, especially in the left-hand lane, so that they can adjust their speed accordingly. For vehicles already on the motorway it allows them to anticipate whether they’ll need to change lanes, or (in the case of a heavy vehicle merging), drop back further to allow more room. Some on-ramps (an example being Symonds Street in Auckland), don’t have much visibility, whereas others, e.g. Greenlane northbound in Auckland have their own lane so merging is less of an issue. 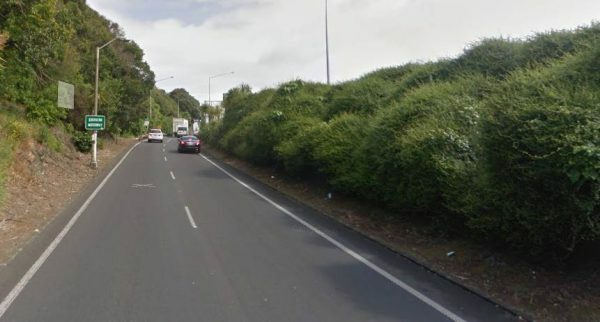 The visible portion of the Symonds Street on-ramp is from the white ute to the right-hand side of the image – not very much for other drivers who are in the left-hand lane doing 80kph when a truck doing 30kph tries to merge. What is the slope of the ramp? Downhill slopes are preferable as it gives the vehicles a much better chance of getting up to the same speed as traffic already on the motorway. Uphill ramps are difficult for heavy vehicles where it can take them over a kilometre to reach 100kph. Downhill ramps also give much better visibility across the whole motorway whereas uphill ramps cause a blind spot over the crest of the rise. It’s impossible to see traffic on the motorway from the Gillies Avenue on-ramp until you’re most of the way there. Fortunately it has its own lane, although that is short and is an exit-only lane to Khyber Pass Road. Merging here causes a huge bottleneck and traffic congestion in the central motorway junction. What is the length of the ramp? Longer ramps give vehicles much more time to get up-to-speed. They also provide more holding space when traffic metering is happening (i.e. there are traffic lights holding vehicles back and releasing one or two at a time). However, the longer the ramp, the more expensive it is to build (up to $500,000 for every 250m). In Auckland, the Tecoma Street on-ramp southbound on the Southern Motorway is very short (only a couple of hundred metres), but is not used by many trucks, whereas the Mount Wellington ramp southbound onto the Southern Motorway is much longer which is more necessary as it’s used by a huge volume of trucks and is uphill due to the motorway crossing over Mount Wellington Highway. What is the width of the ramp? Most ramps can hold two vehicles wide at the point of traffic metering, then merge into one. 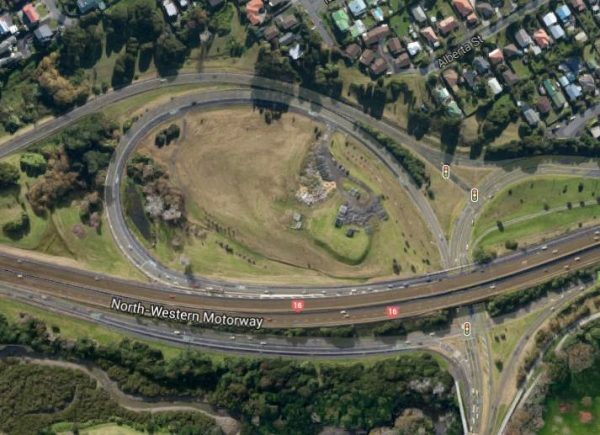 Some ramps have an additional T2 or T3 lane, like Mount Wellington northbound onto the Southern Motorway, shown below. Merging space between the two lanes has to be considered, as well as the angle of merging for vehicles entering the motorway. What is the curvature of the ramp? Ramps with sharp curves just before the motorway are undesirable as they create bottlenecks with heavy vehicles and can reduce the visibility of the motorway. A notable on-ramp with a curve in Auckland includes Waterview citybound (270-degree turn). Waterview on-ramp has a sharp turn and is slow for high-sided vehicles. However, the merging lane is long. Many new on-ramps have traffic metering installed so that vehicles can be held back and fed at intervals onto the motorway during heavy traffic. This means that the ramp must be long enough to hold the anticipated number of vehicles that will queue without causing undue traffic congestion on streets feeding the on-ramp. This is a problem at many ramps that existed before metering was introduced, or when ramps have had to be constructed with extreme space constraints such as the Wellington Street northbound on-ramp where traffic queues back into Union Street and down Wellington Street. Budgetary constraints may influence the exact design of the road. The longer the ramp, the more it costs to produce and maintain in the long run. A shorter ramp may be necessary to meet budget constraints. Newer ramps in greenfield areas can be planned for future growth, but modification of existing ramps in heavily urbanised areas are much difficult.